Stalin sent Santa Claus to the Gulag. Sadaam and Santa were cell mates in prison, but Santa had to escape to deliver presents. While imprisoned together, Santa tells Saddam stories of the good old days when he would travel the world on his reindeer-drawn sleigh delivering presents. 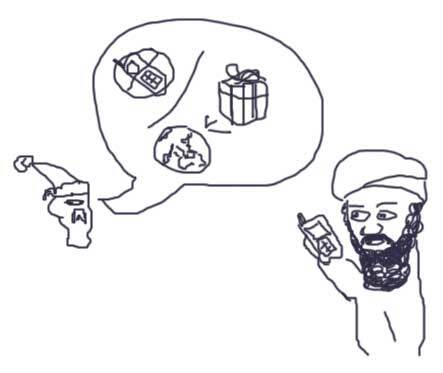 Santa tells Osama that he needs to get out of their cell so he can deliver presents to the world. Stalin->Sadam->Osama->GuyOnCellphone! Love that picture, MoxyKelly! Cant believe i got 'Cell' confused with 'Cell phone'.